It's a plague against modern marriage, turning husband against wife, and tearing families apart. It's America's number one problem in the bedroom (according to handy stat sheets passed out by Barnes & Noble, at least): light. Spouses are leaving the light on, attempting to read past their designated bedtime, keeping their partners awake and putting a potentially insurmountable strain on their marital bonds. The solution: Divorce? Trial separations? Mariticide? A clunky, clip-on reading light? Until now these were the best -- nay, only -- solutions to the problem of reading after dark. All of that is about to change, thankfully, as Barnes & Noble readies the release of the new Nook Simple Touch, with the company's patent-pending GlowLight technology. The addition of after-dark reading capabilities is the most significant update to the company's e-reader, which otherwise remains largely unchanged from last year's model. 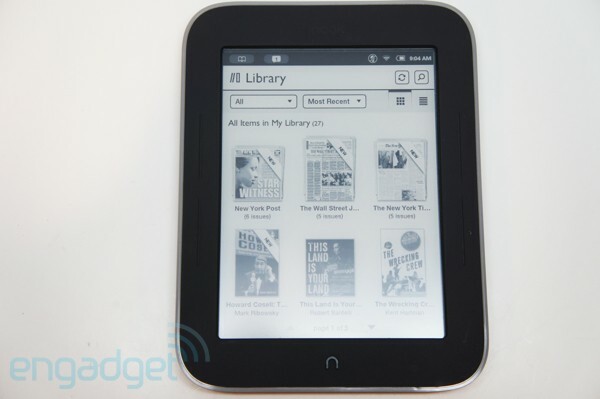 Is it enough to keep the Nook on top of the e-reader heap for another year? Meet us past the break to find out -- that is, if you're not afraid of the dark. Though not everyone will able to justify the $40 premium, the Nook Simple Touch with GlowLight is a worthy investment for anyone who's ever squabbled over lights-out time. 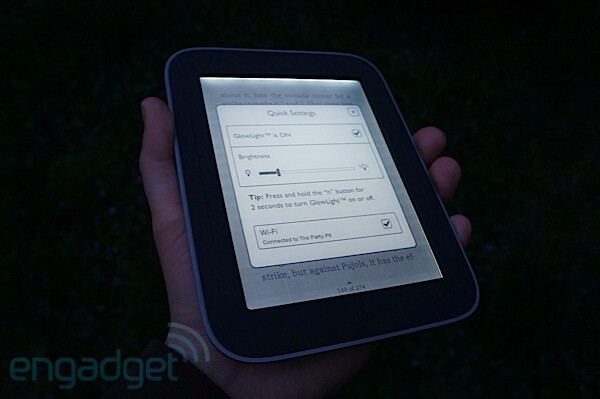 How would you rate the nook Simple Touch with GlowLight? Let's start with the familiar. Which would be... pretty much everything. There, that was easy, wasn't it? Barnes & Noble struck e-reader gold last time out, with an iconic design (to the extent an e-reader's design can actually be classified as "iconic"), with a squat shape and rounded corners. It's a bit wider than the touchscreen Kindle, thanks in large part to its sizeable bezels, which are just expansive enough to keep the device from fitting into some pockets. At least those bezels are home to physical page turn buttons -- two small fins on either side of the screen that let you page forward or back with a press. Amazon dumped that feature with its fourth-generation Kindle devices, but anyone who's ever used one of these infrared touchscreen e-readers can tell you these displays have a vexing tendency to freeze and hiccup. It's nice having some physical buttons to fall back on, if only to avoid hurling the reader across the room in a fit of frustration. Between the extra screen real estate and the concave back cover, the Nook is also easy to hold, especially with one hand. 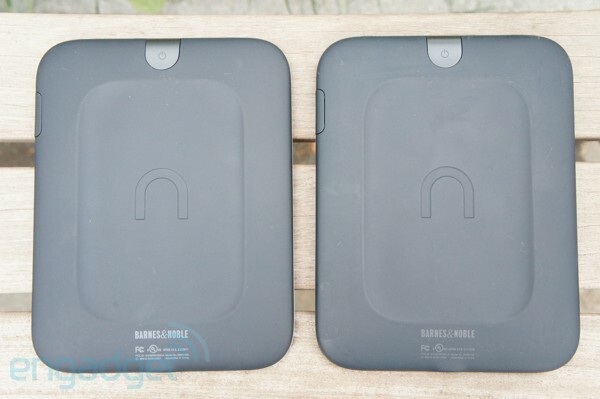 Again, from the front, the device looks pretty much identical to its predecessor: with the Nook logo sitting above the screen and the "n" button below, the latter of which you can use to wake up your sleeping device and pull up the menu bar while you're reading. In fact, the only obvious aesthetic distinction here is a lighter border on the face of the device -- a nice contrast against the dark, matte gray. It's a subtle distinction you're not likely to notice until you place the two devices next to one another, but thankfully it's there so you'll never accidentally pick up a last-generation reader. Just imagine what the rest of your reading group would say if they caught you with one of those. It's almost enough to get you kicked out of book club. On the bottom, just below the border, you'll find the micro-USB port. On the right-hand side is a microSD slot. As ever, there's 2GB of built-in storage (1GB of which can be used for downloaded content), and you can add a microSD card as large as 32GB. Granted, we never actually filled up the memory on our Simple Touch, and therefore never had to resort to extra storage, but it's certainly a nice option for particularly voracious readers. 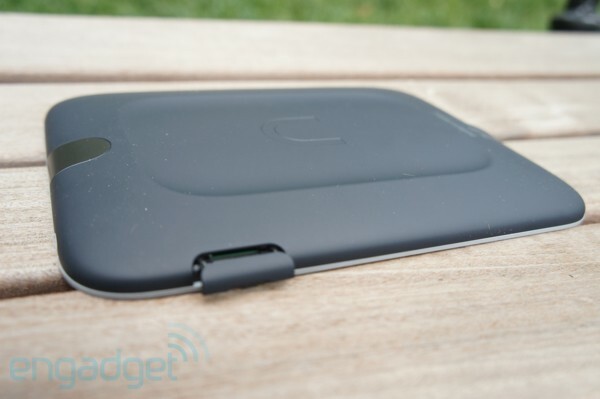 The power button is a large, fingerprint-sized tab that sits on the Nook's back side, up toward the top. On our unit, at least, it feels noticeably looser, even, than the last-gen model does after months of use. You'll mainly use that power button to put the device to sleep and to restart it when it freezes -- an annoyance you'll have to resign yourself to with most any touchscreen e-ink reader. As with the OG Nook Simple Touch, that big, upside-down, horseshoe-shaped Nook logo is stamped smack dab in the middle of the back cover. 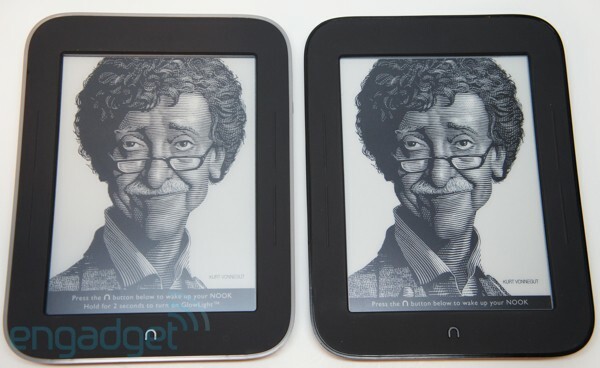 Again, the Nook Simple Touch wasn't broken, so Barnes & Noble didn't need to do much to fix it. Still, we can think of at least one more difference of note: despite throwing in a smattering of new features, the company managed to trim a bit of weight -- five percent in all, making it the lightest Nook ever offered, at just under seven ounces. Again, you're not likely to notice unless you've got the old and new versions to compare side by side, but we certainly aren't going to argue with a lighter reader either. Things are pretty much the same on the inside, too. There's the same 'ole 800MHz TI OMAP 3 processor at the helm, meaning the pages turn at pretty much identical rates (assuming the older unit has undergone the requisite upgrade). The WiFi strength is also on par with last year's model (again post-upgrade), and as with that edition, Barnes & Noble still hasn't caved into the trappings of the 3G world. That lack of choice likely won't affect the lion's share of users, but frequent travelers might miss the ability to download books while on the road. As before, Barnes & Noble is utilizing its brick and mortar locations to offer up free WiFi on the device. You can also piggyback on some 24,000 AT&T hotspots across the country. Battery life has always been a bit of a dicey topic in the world of e-readers. For one thing, companies measure it differently, and also, two-months-plus runtime is one tough claim to test. Case in point: Barnes & Noble has actually altered the measurement for the battery life of the Nook Simple Touch between the release of devices, all while standing by the claim that the battery life has remained the same, in spite of the device's slightly lighter weight. The original rating was "up to two months, based on one hour of reading per day," a ceiling that has since shifted to "over two months, based on 30 minutes of reading per day" for both devices. Of course, turning on the GlowLight will cause the battery life to take a hit, cutting it in about half. Unless you're visiting Alaska in the off-season, though, odds are you're not going to be relying on the light that heavily. Here's where the new Nook shines -- literally. For those who wondered where devoted e-readers could possibly go after touch, Barnes & Noble offered a simple, but powerful solution: light. Let's look at the facts here: the earth's pesky rotational habit significantly eats into your reading time. If you're doing your reading on, say, an iPad, Kindle Fire or Nook Tablet, that's not really an issue, thanks to LCD backlighting. 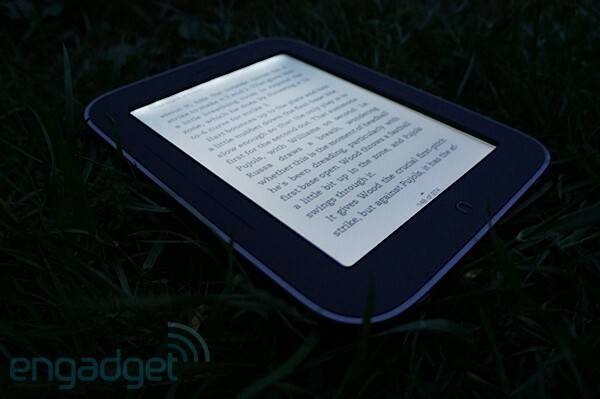 Until now, reading at night hasn't really been an option on e-ink devices. The new Nook isn't the first with a built in light, sure, but past models haven't always done a great job distributing the illumination. With most mainstream models, meanwhile, you're stuck picking up a clunky external light or a pricey (but oh-so elegant) accessory like the Kindle Lighted Leather Cover. On the whole, Barnes & Noble has done a good job of distributing the light across the display. The easiest way to access Barnes & Noble's patent pending GlowLight feature is by holding down the "n" button on the front for roughly two seconds. The light patently emerges from the top of the six-inch display. Tilting the reader with the bottom side up, you can actually catch a glimpse of the lights. Even without titling, it's easy to identify the top as the light source -- it's noticeably brighter up there. The light also appears a bit more intense around the border of the screen. On the whole, though, Barnes & Noble has done a good job of distributing the light across the display, and the slight gradient isn't really distracting once you start reading. This editor spent an hour before bed immersed in the new Johnny Ramone autobiography, and as advertised, the light isn't harsh on the eyes (the company claims that the strain should be "equal to or less than" what you'll experience with a backlit screen ). At least, that's the case after you adjust the screen. In pitch-black darkness, the default setting is pretty intense -- like, close-your-eyes-and-you'll-still-see-it intense. We dialed it down to about a fifth of its full setting. Thankfully, too, once you tweak the settings once, the Nook will automatically default to that brightness level the next time you turn the light on. Still, it's clear certain sacrifices were made to accommodate this new feature. A new anti-glare layer has been applied to the display, to maintain the device's readability in direct sunlight -- something Amazon and Barnes & Noble will happily remind you is quite difficult on tablets with garden-variety LCD screens. And indeed it does a good job of cutting the glare -- in fact, held up to the light, the new Nook is a bit less reflective than its predecessor. It's hard to say whether it's this added layer or some other bit of hardware, but when placed next to the original Nook with identical pages on the screen, there's significantly less contrast with the text here. 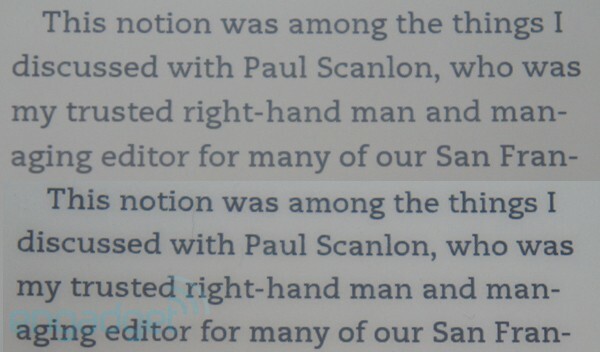 The darkness of the e-ink on the new Nook is a bit uneven across the page as well. This is a pretty big bummer -- the crisp contrast of E Ink has long been a selling point of these devoted readers, promising replication closer to physical books than tablets can offer. On the new Nook, the page looks a bit unevenly printed. It's another one of those things you might miss at first glance, but that you can't really un-see once you've had a chance to see the two devices next to each other. The addition of that anti-glare layer also appears to have had the unintended consequence of giving the screen a bit more texture. The responsiveness, however, remains the same, thanks to the infrared technology being used here. Swiping, tapping, etc. are just as smooth as they are on the original Simple Touch. Unfortunately, Barnes & Noble still isn't matching the dual-touch offered up on Sony's reader, so you can't simply pinch to zoom when you feel like adjusting text size. Again, not much new to report. If you treated yourself to the Simple Touch upgrade, you pretty much know what's in store here. You've got the Home page at the center of the experience, showing you how far into your current book you are, along with a list of New Reads (your most recent downloads) and recommendations for what to read next at the bottom. Along the top tool bar is a link to your current book, a space for notifications (we have one at the moment, compelling us to invite people to be "Nook Friends"), WiFi signal strength, battery life and time. There's also an additional icon that lets you know whether or not you've left the light on. Clicking this will bring you to the GlowLight settings, which you can also access by clicking the "n" button. Book pages are quite simple -- as they should be. The majority of the page is devoted to text, with the title of the book up top and a page number at the bottom. Yep, the Nook defaults to page numbers, rather than the "Location" metaphor used on the Kindle. Honestly, we're a bit partial to Barnes & Noble's more traditional take on keeping track of your progress. A little arrow icon above the page number brings up a menu from which you can access the table of contents, perform searches, re-size the text or skip ahead in the book. There's also a little bookmark icon in the upper right hand corner for -- you guessed it -- marking pages. As ever, you can highlight text to add notes, share over social networks or look up definitions in the Merriam Webster dictionary. It's all still pretty no-frills, with an emphasis on what Nook does best: good old-fashioned reading. With good reason, when Barnes & Noble was ready to unveil the Nook Simple Touch with GlowLight it skipped the pomp and circumstance it usually reserves for Nook product launches. There was no splashy press conference this time out; just one-on-one meeting with members of the press. The company says this was because the GlowLight technology doesn't translate as well in a press conference-type setting. Fair enough, but it's to imagine a relatively minor upgrade like this commanding that kind of all-star treatment. Still, that upgrade is a rather welcome one, as it addresses a key issue with e-reading technology and could even have a real effect on users' reading habits. If you can't wait that long, the $40 extra is justified. No longer being at the mercy of the sun's whims means lot more reading. Indeed, the addition of GlowLight should add some extra utility for frequent travelers, insomniacs and the nocturnally inclined. And heck, if Barnes & Noble's numbers are to be believed, perhaps it will even save a marriage or two. The loss of contrast is certainly a bit of a compromise, though it's not likely to be a dealbreaker for most users. Pricing, on the other hand, might be. The Nook Simple Touch with GlowLight costs $139, a $40 premium over the light-free Nook Simple Touch -- which is admittedly priced to move compared to the $139 ad-less Kindle. Funny, $139 is also the price point the Simple Touch was selling for back when we used to call it the Nook WiFi. Odds seem pretty good that if you can wait until after the Mother's and Father's Day rushes, you can probably pick one of these up at a healthy discount. If you (or your marriage) can't wait that long, however, the $40 extra is justified. After all, no longer being at the mercy of the sun's whims means lot more reading, and that's sort of the whole point of picking up a reader in the first place, right?